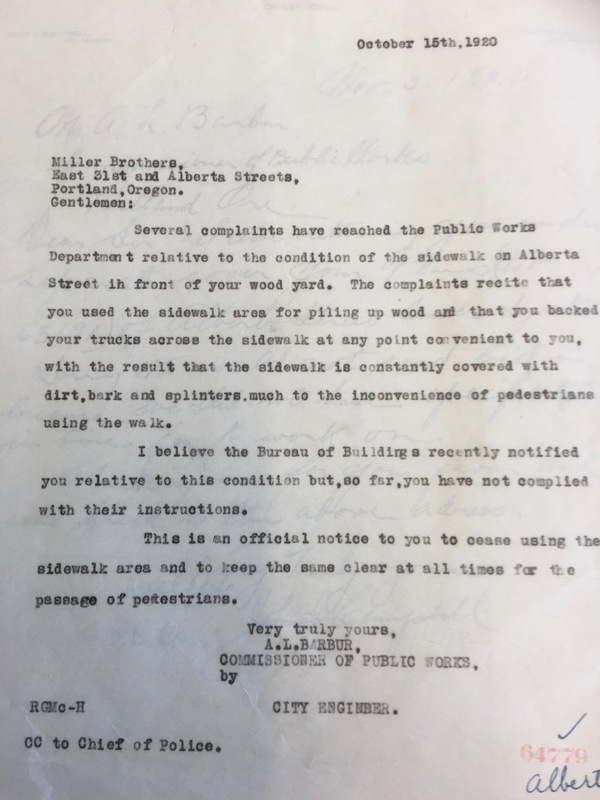 We’ve had the opportunity recently—thanks to Portland City Archives and a sea of digital copies of early newspapers—to become fully immersed in the layout, feel and day-to-day life of the neighborhood in the 19-teens. It was a busy place: not unlike today, but busier, dirtier and a bit more helter-skelter as the landscape transitioned from brush and trees into a neighborhood of homes and people. Oh, and very few cars. Imagine our now-jammed streets without the lines and lines of parked cars. The sound of construction filled the daytime air as houses and business rose to life. The Alberta streetcar was omnipresent—every 15 minutes clattering down Alberta to NE 30th and then turning north down the gentle slope to Ainsworth, and back. It was our connection to Portland and beyond and everyone rode it. 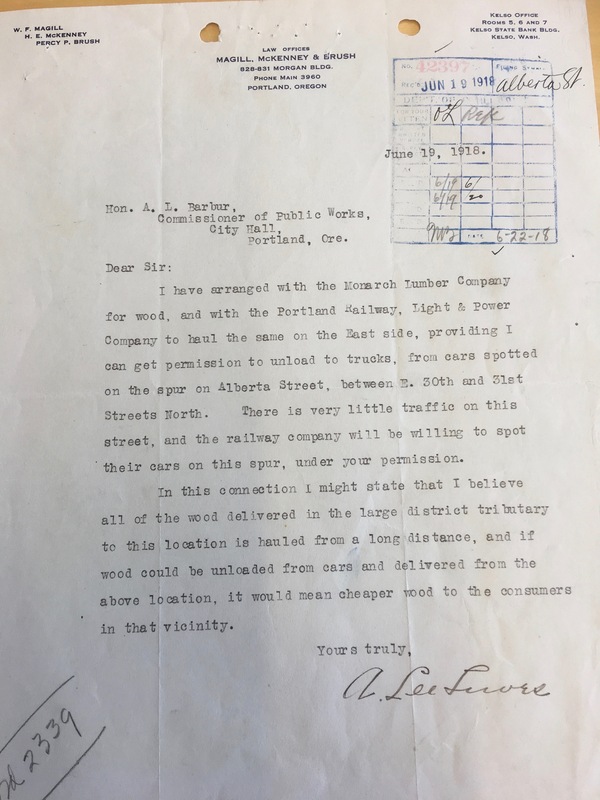 Portland Railway Light and Power (which ran the streetcar system in our part of town) had to add extra cars on the Alberta line to carry the abundance of neighbor/riders, and they were still packed in. 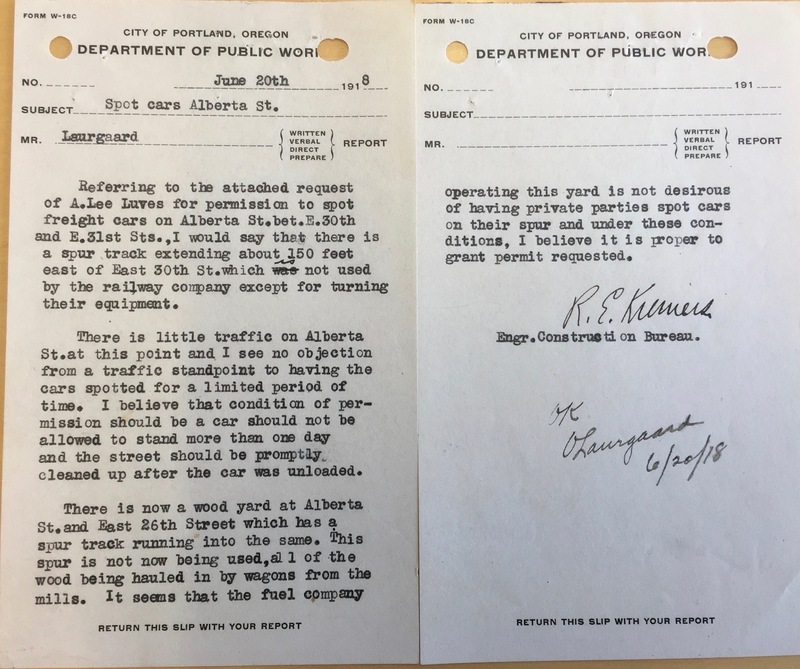 A cooperative engineer from the city’s Department of Public Works wrote back noting how little car traffic there was on Alberta (it was all streetcar and by foot) and approved the move, asking only that the street be promptly cleaned up after the flatcar was unloaded. With this green light, Monarch Lumber moved their flatbed car onto this quiet stretch of Alberta and went into the firewood business. Meanwhile, the wood yard mentioned by Engineer R.W. Kremers a few blocks west at East 26th and Alberta, had ramped up its own firewood business, but was apparently making a mess and was being protested by most of the neighborhood. The city wrote the business in October 1920 with a strong message, cc’d to the Chief of Police. Next time you pass that way, near the Alberta Rose, Cha’Ba Thai or Vita Café, imagine a street filled with flatcars and firewood, and neighbors readying their furnaces and warm homes for winter. The handwritten date at the bottom of the memo: 6/20/18. Looks current to me….wait…that 1918! Thanks, Doug for allowing us to visualize what was going on a few blocks away, a century ago. BTW, my house (built in 1914) had a sawdust burner. Converted to oil in 1946. And I converted to Natural Gas around 2000. Another great glimpse into the past. Thanks! !